Post-doctoral fellow Virginia Garcia Millan is testing whether algorithms used in drones for existing applications, such as hydrology and forestry, will also work for crop damage estimates. The idea is to better quantify crop damages and improve an online app called SkyClaim, developed by Skymatics, a startup offering remote sensing solutions and drone services, co-founded by U of A science alumnus Cassidy Rankine. The results so far are encouraging. "(The agricultural and insurance sectors are) telling us they find it very useful for their daily work," she said. "Particularly, we've had high interest from agronomists and adjusters who would like to use this tool. "It's a project that reflects where modern farming is headed," she added. The algorithms use drone data collected in the skies over 20,000 acres of wheat, canola, barley, corn, potatoes and hemp crops stretching between Edmonton and Lethbridge, along with data from nearly 100,000 acres worldwide, recorded through a crowdsourcing campaign for drone users online. 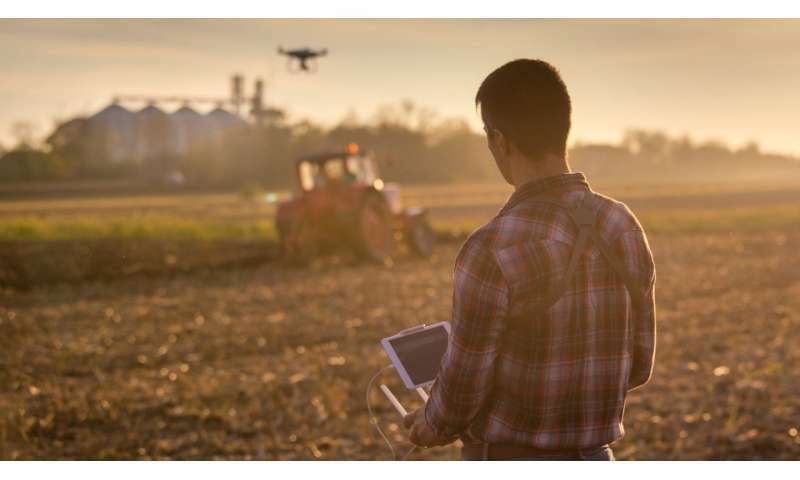 The high-tech, bird's-eye approach offered by drones can be tailored to different crop loss situations while largely automating the estimation process, reducing human subjectivity. Traditionally, adjusters visually estimate crop damage from the edges of the fields or by walking them in an M-shaped pattern, but drone data gives a wider-ranging perspective to show the true extent of yield losses over much larger areas of farmland, said Garcia Millan, who is on a team in the Faculty of Science exploring new uses for unmanned aerial vehicles. "Sometimes there are disagreements between what adjusters declare and what farmers consider they lost. A good estimation of crop damage is fair for both. Having an objective and accurate estimation of crop damages measured in acres for the entire field, rather than just a few sample locations, can save thousands of dollars to insurance companies or ensure farmers get fair compensation," she explained. Insurance companies can also be overwhelmed with claims in a massive weather event, meaning delays in viewing damaged cropland, which in turn can result in less accurate estimates. But drones collect an aerial overview almost immediately after a destructive event, using advanced image analysis techniques and machine learning algorithms. "We then have an objective and accurate quantification of the damage," she noted. The algorithms Garcia Millan is testing generate an ultra-high-resolution digital map of the field, a 3-D model of the crop surface and a table with damage estimates broken down into hectares, percentages of loss and monetary values, all delivered on the user's mobile device by Skymatics in a report that's quick and easy to interpret. "Crop damage can differ, depending on several factors," Garcia Millan said. "This level of detail is tailored to the type of damage—hail, wind, wildlife, fire or frost—the intensity of the damage, the type of crop and its growth stage," she said. The next step is to integrate Garcia Millan's 3-D crop loss algorithms into the Skyclaim web app in beta form for the 2018 growing season, Rankine said. "We'll get user feedback, then go into widespread commercial use by the end of the year," he added. "It's an app we feel is going to really show how drones can serve industries like the insurance and agricultural sectors." People fear armed robots but eradicating feral hogs for instance would be one very good use for them. -and autonomous drones with guns may be an acceptable alternative for people who think that getting pleasure from hunting these animals from helicopters and pickup trucks is immoral. What could possibly go wrong with that?!?!?! More scenes from your dystopian AI-driven future vision, Otto? What could possibly go wrong with drunken bohunks flying about the countryside shooting moving objects with AR15s? How come you didnt ask THAT question? ?